This recipe is just so simple; it’s nourishing, comforting and easy on the pocket. This mash could be a main meal or a side dish, served hot, or served chilled as a dip. 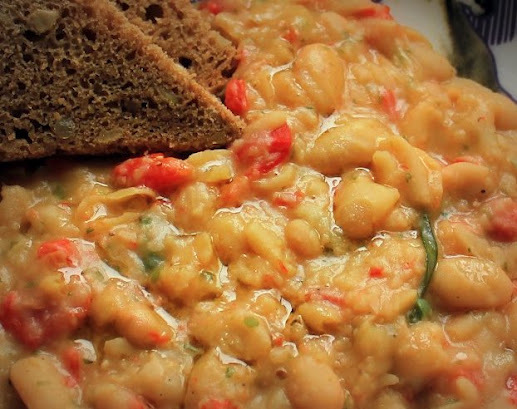 I used tinned Cannellini beans, but jarred Spanish white beans work equally as well, if not better! Serves 4 as a side or two hungry ones as a main course. Soften diced pepper and garlic in 1 tbsp olive oil, over a gentle flame. When pepper is soft and oil tinged with delicious fiery red, add the beans and stock then turn up heat until mixture begins to simmer. Stir occasionally until beans lose their form, becoming mushy. Add oregano and rosemary and cook for a further 5 minutes, stirring all the while. Season to taste, take off heat, then stir in another tbsp of olive oil.